Manado - The government is optimistic that the 23% target of the New Renewable Energy (EBT) energy mix by the end of 2025 will be achieved. To make it happen various strategic steps have been taken by the Government. One of them is by optimizing the potential of local energy to be maximized as the main energy source. This is because not all regions have maximum EBT potential and are able to be developed commercially. "If the EBT is more to local wisdom . Why (local wisdom)? 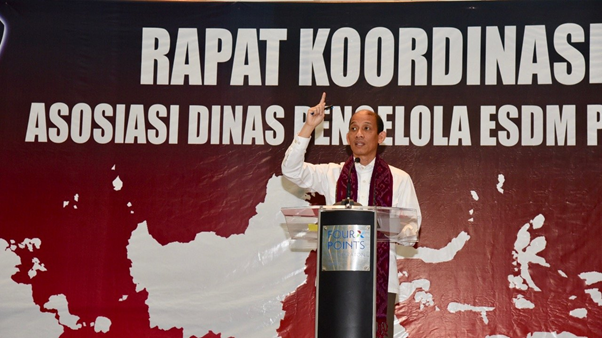 Because not all regions have (potential) EBT," Arcandra explained after opening the National Coordination Meeting (Rakornas) Association of ESDM Provincial Management Offices throughout Indonesia in Manado (23/8). In addition to utilizing the region's potential, Arcandra also explained other government efforts to encourage the achievement of 23% energy mix, namely by utilizing Solar PV on rooftoop which the regulation is being finalized and will be published soon. "We are doing our best to ensure that the 23% energy mix is ​​achieved, one of which is with Rooftoop (Solar PV). We are currently completing the ESDM Minister's Regulation as soon as possible," said Arcandra. The advantage of using solar energy for households is estimated to be able to save the cost of electricity expenditure between 20-30 KWh. The savings can later be exchanged through an export-import mechanism to PLN. "With the rooftop (Solar PV), the usage of which is usually 100 KWh can be reduced between 20-30 KWh. Now this is what we export to import to PLN," Arcandra concluded. As is known, the Government continues to maintain optimal composition of the energy mix for power generation. This effort was taken through the ratification of the Electricity Supply Business Plan (RUPTL) of PT Perusahaan Listrik Negara (PLN) Persero 2018-2027.